When summer's in its prime, there's no good reason to spend time inside. After all, school is out, days are longer and temperatures are just right. If you're looking for ways to have fun with your family and friends without entertaining indoors, consider hosting a backyard movie night. People of all ages will enjoy kicking back, having delicious snacks and drinks, and watching a great flick. For the best viewing experience, project your chosen film onto the side of your home, garage, fence or other structure. While you can project directly upon white and light-colored buildings, darker surfaces will make it difficult to see images. To fix this issue, simply cover the structure with a white sheet. Once you've created your "screen," it's time to place your projector. It may vary depending on what model or type of projector you use, but typically it's best to place the machine a few feet back from the surface upon which you plan to project. Make sure your projector hooks up to a computer, tablet or DVD player and that you have access to the movie in the corresponding format. Now that you're certain your guests will be able to see, it's time to figure out how they'll be able to hear. If you don't own speakers, see if any of your friends can bring a pair, or search around online for affordable rental options. When preparing for your movie night, figure out if you have access to electrical outlets because your equipment may need to charge mid-movie. If your movie watching setup is located far away from outlets, use extension cords to make it work. 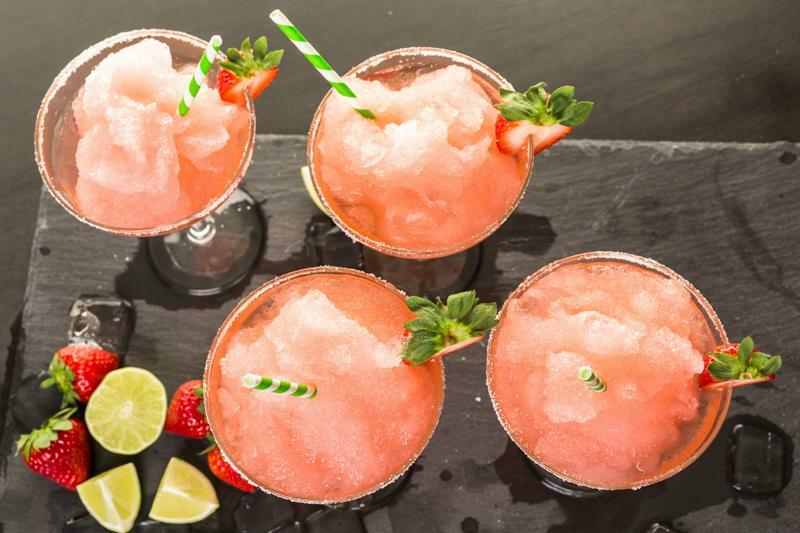 Serve up frozen concoctions at your next outdoor movie night. Create a cozy paradise in front of your screen by laying blankets or mats on the earth and covering them with pillows, sheets, throws and other plush items. If the forecast looks breezy or cool, set out a bin filled with extra blankets, sweatshirts and jackets to keep your guests comfortable no matter what. For people who may want more support from their seats, create an additional row using folding chairs and patio furniture. As you build the perfect viewing space, test out every seat to make sure nobody's view will be obstructed during the film. While you want your yard to be dark so the projection shows up clearly, you don't want people tripping over each other on the way to the restroom. Create a magical ambiance and provide your friends and family with some illumination by hanging twinkle lights or burning tiki torches all around your yard. Soft lighting like this won't detract from the main event, but rather add to the overall party aesthetic. It's not a summer party unless there are delicious treats and irresistible frozen cocktails. Think outside the box for this movie viewing, and whip up a delicious slew of finger foods and frozen concoctions that will keep people begging for a double feature. In keeping with a movie theater theme, consider offering a build-your-own popcorn bar, where guests can embellish plain kernels with sweet and savory seasonings. Classic party favorites, like chips and salsa, are also bound to be popular with your hungry film fanatics. And no movie theater is complete with candy, of course, so be sure to have plenty of sugary treats guests can nibble on. Quench everyone's thirst and make it a night to remember by mixing unparalleled frozen concoctions in your Margaritaville® Frozen Concoction Maker®. There's nothing like sipping on a refreshing frozen drink while enjoying friends, film and summer fun. The cornerstone of any successful movie night is, naturally, a fantastic flick. While it can be difficult to please everyone, even the toughest movie buffs embrace certain classics, so don't be afraid to stick with an old standby. If you've got a mix of children and adults to entertain, try screening one of the latter group's childhood favorites, and watch as both generations light up with joy.